I was at the grocery store a couple weeks ago and they have these big ol’ hams they’re selling for $.99/lb. So, me being me I couldn’t resist and I picked up a nice one of 22 lbs. and put it in the freezer for future use. I made a double batch of this, very tasty, Black Eyed Pea Soup.The rest of this story will come later in the week with the Split Pea Soup. Place all ingredients in a large deep pan. Reduce heat and simmer (covered or uncovered depending on desired consistency) 2-3 hours, or until black-eyed peas are tender, stirring occasionally. I love soups and this soup is going to be a favorite. Better buy get ham hock soon. Nice n spicy soup, just the way black eyed peas should be served if you ask me! 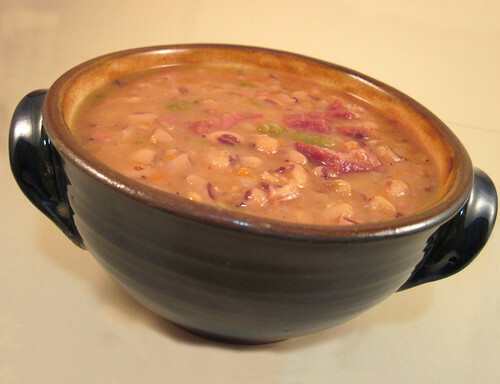 Soup is great this time of year and a black eyed pea soup sounds hearty and tasty! Okay, this soup looks great, but I LOOOOOOVE that bowl! Ok. I must find this liquid smoke. It seems so popular to use!